Automotive suspension system is a basic system which is used to suspend a vehicle frame, body, engine and other parts above the wheels. Suspension system is equipped in a vehicle in order to control forces produced by the tires while acceleration, braking and cornering. The suspension system protects the automotive itself and any luggage from damage and wear. Global automotive suspension system market is anticipated to grow at significant compound annual growth rate (CAGR) of 4.8% during the forecast period i.e. 2018-2025. The global market for automotive suspension system is likely to reach at exponential sales by the end of forecast period. Additionally, outstanding sales of automobiles in developing region and rapidly expanding two wheeler industries are the major factors propelling the growth of global automotive suspension system market. 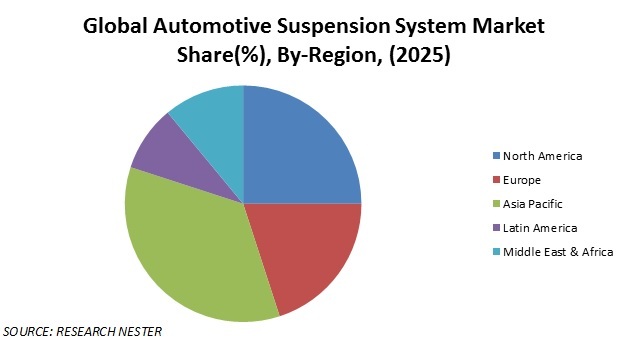 On the basis of regional platform, global automotive suspension system market is segmented into five major regions including North America, Europe, Asia Pacific, Latin America and Middle East & Africa region. Asia Pacific region captured the largest automotive suspension system market all across the globe. Further, thriving population, rising per capita income of the consumers, and changing life style of middle class families are some of the major factors which are anticipated to bolster the growth of automotive market during the forecast period. This factor is envisioned to propel the growth of automotive suspension system market. Moreover, China and India are the major countries contributing in the growth of automotive suspension system market in Asia Pacific region. Moreover, factors such as growing economy and presence of large number of consumers in these countries is paving positive outlook for the growth of automotive suspension system market. Moreover, China is the leading producer of the automobiles and likely to contribute significantly in the growth of Asia Pacific automotive suspension system market. Furthermore, North America region captured the second largest share in the market of automotive suspension system and believed to grow at satisfactory growth rate during the forecast period. Apart from this, U.S. is the major contributor in the market of automotive suspension system in this region. Additionally, technological advancements related to automotive suspension system by major key players in this region are some of key factors which are envisioned to fuel the growth of North America automotive suspension system market. Additionally, Europe region is also projected to witness high growth rate during the forecast period. Growing technological improvements along with introduction of advanced suspension system for electric vehicles is envisioned to escalate the growth of automotive suspension system in this region. Moreover, rising number of automobiles and growing disposable income of the consumers are some of the factors which are expected to foster the growth of automotive suspension system market in Middle East & Africa region over the forecast period. Increasing production and sale of automobile is one of the major factors propelling the market of automotive suspension system all across the globe. For instance, according to OICA, 94.7 million motor vehicles produced in 2016. Moreover, this represented a Y-o-Y growth of 5.0% as compared to 2015. Moreover, automotive production is anticipated to increase on the account of rising demand. This factor signals promising growth of the automotive suspension system market. Moreover, global automotive industry is booming on the account of urbanization and rising disposable income. This massive growth of automotive industry is growing the automotive suspension system market all over the globe. In continuation of above factor, the market is fuelling due to rising production two wheelers in the developing nations such as India, China and others. Additionally, consumer demand for vehicle is increasing at a massive pace. This rise in production of vehicles is also fostering the production of automotive suspension system. Furthermore, changing life style of consumers and rising disposable income especially in emerging countries have increased the demand for passenger cars which in turn escalating the growth of automotive suspension system in vehicles. Moreover, the number of electric passenger cars is projected to reach 450 million units by 2040. However, less adoption rate of two wheelers in some countries due to two wheelers are not considered as a safe mode of transportation is also believed to hamper the growth of automotive suspension system market during the forecast period. 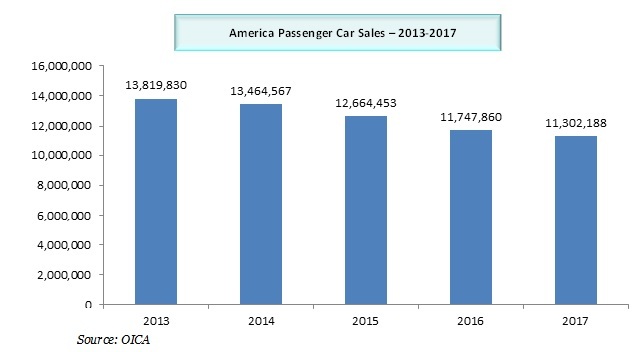 Moreover, declining sales of passenger car sales in America region is projected to dampen the growth of automotive suspension system market over the forecast period.